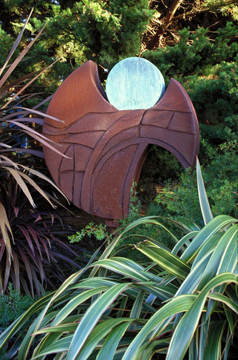 84" x 42.5" x 7"
Fabricated corten (weathering) steel and bronze with blue patina. This is an elegant sculpture, held high on a 4” square pedestal. To give dimension to the face of the sculpture, there are four layers of steel composing the surface area. Luna, a Greek goddess, historically represents the moon.